A miniature brass trumpet ornament . 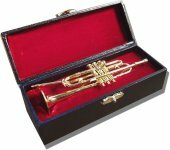 A miniature brass trumpet ornament complete with velvet lined hard case. A perfect gift idea for the trumpeter or jazz music lover!.